For many years now, computers have been able to represent audio files in spectrographic form, where left to right is the timeline, up and down represents frequency and intensity and/or color changes represent changes in sound level. 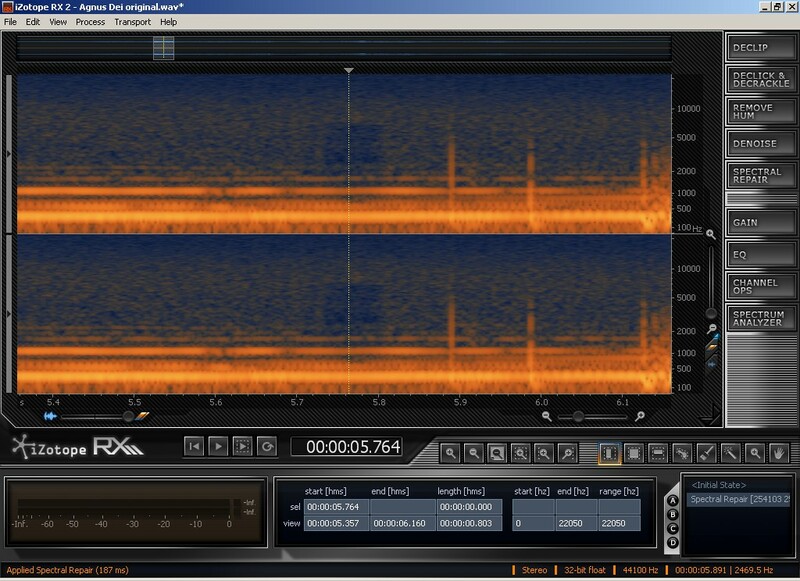 In typical use, the spectrogram display is used for visual analysis of an audio file, but is not used to act directly on that file. 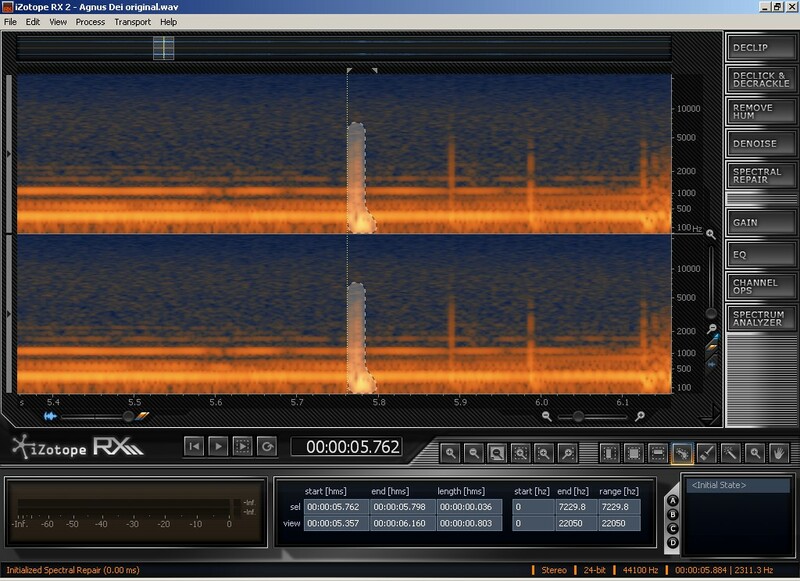 This changed in 2002 when CEDAR introduced Retouch, which allowed the operator to select portions of the spectrogram and alter or replace them with adjacent audio. It now was possible to repair audio dropouts or remove unwanted sounds with almost surgical precision. Even wrong notes could be removed from within musical tracks with little or no disruption to the rest of the sound. CEDAR Retouch is expensive, like most of CEDAR's software and hardware, which is aimed at the high level professional audio market. However, it was just a matter of time until other software companies introduced similar products that were more affordable and iZotope RX, introduced in 2007, was such a product. The current incarnation, iZotope RX2, is available in Advanced and Base versions; the latter costs only $349 list price. I have been using the Base version and can report that it is a high quality audio restoration suite. Indeed, compared to the Waves Restoration Suite, which I have used for a few years now, the Base version of RX2 is superior in many ways. The Advanced version of RX2 offers additional control over the various functions, which can certainly be useful, but the Base version is already good enough for serious work. RX2 can be used as a suite of plug-ins for various hosts (it plays nicely with Pro Tools LE, for example) or it can be used as a stand-alone program. The spectral repair part is definitely easier to use in the stand-alone program, and that is how I shall demonstrate it here. Screen shot 1: Here we see the main workspace with a noise that has been selected for treatment. Similar noise spikes can be seen to the right in the display. The recording being restored is of a choir singing in a chapel. Unfortunately, the analog tape recorder that was used had circuitry that was malfunctioning, and various noise spikes and crackles were superimposed over the music. Screen shot 2: Here we see the display after the noise spike that was selected has been removed. The only evidence of the repair is a slight darkening of the background in the upper frequencies--there will probably be a small reduction in audible tape hiss at that point. Here is an MP3 file of the same recording seen in the screen shots. We hear a short segment before restoration and after. Note that the "after" portion has been subject to broadband noise reduction as well, to reduce the analog tape hiss. The spectral repair is very good but not perfect--a slight trace of the original noise disturbance remains. The next file is another live recording (recorded to a DAT machine) of a soprano singing with piano accompaniment. There are two noises in this segment that were removed--a thumpy click (an audience member moving near the recording microphone) just after the beginning, near the right speaker, followed a few seconds later by a cough off to the left. First we hear a short segment with the noises, then we hear the same segment after spectral repair. In this case, the repair is audibly perfect--the offending noises are simply gone. Lest you think that RX2 can do anything when it comes to removing unwanted sound, the next MP3 file demonstrates a noise that I could not remove satisfactorily using spectral repair. Again, we have a live music recording, this time of a classical guitarist in a noisy church. Right at the beginning of the selection, we hear a loud cough, which overlays the guitar sound. The selection is then repeated twice, with two different repairs. First we hear my best attempt at removing the cough via spectral repair, which is not completely successful--a strange sounding "echo" of the cough remains. (I experimented for a half hour and was not able to do any better than this.) Then we hear a rough edit of the same segment, using other material spliced in to cover the part that had the cough. I should mention that if I had done the editing in Pro Tools, instead of in Sound Forge, it would probably be more seamless--ProTools has cross-fade capabilites that Sound Forge 9.0 lacks. Assuming that I could make the edit a little smoother, it does seem to be the way to solve this particular audio problem. As we have seen above, spectral repair, at least as done by me with iZotope RX2, cannot remove all unwanted audio noises without artifacts. In some cases, time honored methods of editing around such noises will be the better choice. But there is no doubt that spectral repair does give us a powerful tool for solving many audio problems. In years to come, software programs like RX2 will likely become more powerful and easier to use, and the results will be even better. I should mention that the more traditional parts of iZotope RX2, the broadband noise reduction module, the declicking and decrackling, hum removal, etc., are all of high quality. If you take the time to learn to use the software properly, I think you will be pleased with the results.